Perth, Australia—Rio Tinto doesn’t release many details when sharing the results of its annual Argyle tender but, then again, one doesn’t need many specifics to trace the trajectory of red and pink diamonds prices. They are climbing and will continue to do so as the closing date for the Argyle Mine in Western Australia draws closer. 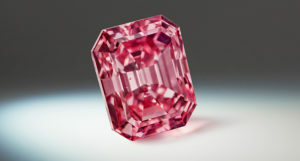 And though the London-based miner always has been tight-lipped about the Argyle Pink Diamond Tender results—it doesn’t reveal the sale’s total, prices paid for individual diamonds or names of buyers (unless allowed)—it did note that the 2018 sale set numerous records, including tender total and prices per carat. 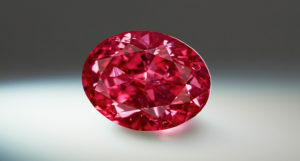 The diamond that sold for the most money was the “Argyle Muse,” a 2.28-carat fancy purplish-red oval. Purchased by an undisclosed bidder, Muse is now the most expensive diamond sold in the 34-year history of the tender. Muse took the title from Everglow, the fancy red Optimum Diamonds LLC bought last year. Though he declined to reveal the Everglow’s purchase price, Optimum CEO David Shara said the 2.11-carat diamond is for sale for $18 million. It is also being offered as part of a collection of more than 60 red diamonds amassed by the CEO and his business partner; he said it is the largest collection of its kind in the world and is worth about $200 million. The wealthy want to own rare diamonds from Argyle for the same reason they are paying huge amounts of money for works for art, like the $450 million a Saudi prince spenton Leonardo da Vinci’s “Salvator Mundi” last year—they want to park their money in tangible, portable assets at a time of geopolitical instability worldwide. “That’s how people are treating these rocks,” he said. 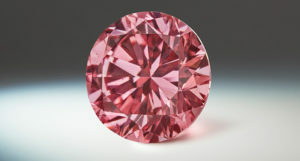 The desire for colored diamonds is also evident in the auction market, where the stones are continually setting records. At a jewelry auction just last week, Christie’s sold an 18.96-carat pink diamond for $50.4 million, or $2.6 million a carat excluding fees, a new price-per-carat record. And the most expensive jewel ever sold at auction is still a pink diamond, the nearly 60-carat Pink Star, which garnered for $71 million. According to Shara’s estimates, the prices paid for a 1-carat vivid pink or a 1-carat fancy red in this year’s Argyle tender were up 41 percent year-over-year, and he expects prices for Argyle pinks and reds to spike at least another 40 percent when the mine closes 18 months from now. Rio Tinto did not respond when asked to confirm this fact, but the mining company did state in its tender results press release that in the past 18 years, the value of Argyle pink diamonds sold at the tender have appreciated more than 400 percent, outperforming all major equity markets. Shara said despite the continual upward trajectory, he’s not concerned about the bottom falling out of the market for Argyle’s pink, red and violet diamonds. While there has been some price correction in colored diamonds, Rio Tinto’s mine is a finite resource for which the finale is drawing near. Rio Tinto’s 2018 sale of pink, red and violet diamonds from Rio Tinto’s Argyle mine in Western Australia included a total of 63 diamonds weighing nearly 52 carats. Among them were a half-dozen “hero stones,” the top diamonds in the group to which Rio Tinto ascribes individual names. —Argyle Mira, a 1.12-carat fancy red radiant. Glajz THG in Singapore, a manufacturer of bespoke pieces, bought the Alpha, while Gemcut Geneva was the winning bidder for the Odyssey. Gemcut Chief Executive Matthew Aldridge said the Odyssey is a match for another Argyle stone sold in the tender about 15 years ago. New York-based diamond company Leibish & Co. bought three stones in the 2018 tender, two of which sold the day they were purchased, said the company’s director of content marketing and public relations, Meira Ovadia. Leibish’s remaining stone is lot No. 63 from the sale, a 2.34-carat radiant-cut the company has dubbed the “Kimberley-Rose.” The diamond is fancy intense pink and SI1 clarity.